Nasser Chegini is a member of the UF Wound Institute who studies the basic cellular changes that take place during wound healing, with a particular emphasis on the role of growth factors in reproductive tract tissues. Chegini, a professor of obstetrics and gynecology, is currently principal or co-principal investigator on four National Institutes of Health grants totaling nearly $4 million. Dr. Chegini serves as the backbone of the research effort in the Department of Obstetrics and Gynecology,” says department Chair Keith Stone. 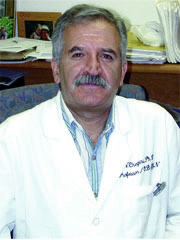 During his career at UF, Chegini has conducted significant research on the wound-healing process, particularly in the female reproductive tract. His current research focuses on the role of cytokines and hormones in wound healing among women suffering from non-malignant tumors called uterine leiomyomas, endometriosis and other reproductive tract diseases. The biomedical and molecular analysis of the reproductive and peritoneal environment may leas us to the development of strategies to prevent leiomyoma and endometriosis,” says Chegini. “Leiomyoma and endometriosis affect thousands of women, resulting in more than 300,000 hysterectomies each year in the United States.